ZOFFANY (IRE) (Bay 2008-Stud Ire. 2012, Aust. 2012). 5 wins at 2, Curragh Phoenix S., Gr.1. Out of a half-sister to SW Spotlight. Sire of 80 rnrs, 28 wnrs, inc. SW Foundation (Newmarket Royal Lodge S., Gr.2), Illuminate, Waterloo Bridge, Argentero, Washington DC, SP Light Up Our World, Dolce Strega and of Bint Aldar, Accurate, Al Shahaniya, Kechevarria, Knife Edge, Ventura Storm, Essenaitch, Spongy, Architecture, etc. His oldest Aust.-bred progeny are 2YOs and inc the placegetters Eyezoff, etc. Annah Haze (f. by Churchill Downs). Winner at 1100m in 2014-15 in Aust. VARGNA (Regal Classic). 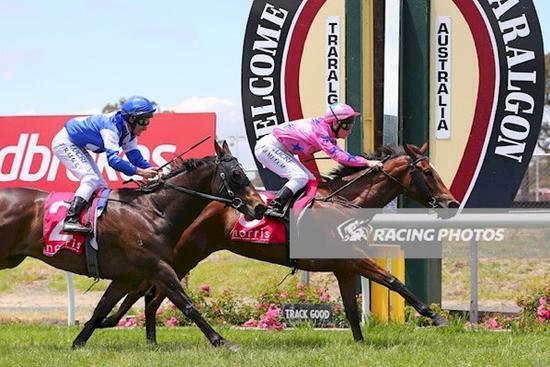 4 wins-2 at 2-at 1000m, A$123,980, SAJC Dermody S., Gr.3, Mahaasin 2YO H., Lakewood Stud Happy Giggle H., 2d SAJC WH Wylie H., L, Better Loosen Up 2YO H., Christmas Twilight H., Jayco H., 3d SAJC Strathmore Hotel Flying H., Bonnett's Saddlery Flying H.
Jeune Amour. 4 wins-1 at 2-from 1050m to 1800m, SAJC Carlton Draught H., We're Smoke-Free H., 2d SAJC Marsh H., Minster Carpets H., 4th SAJC Stuart Crystal Laelia S., L.
Kizz's Munro. 3 wins at 1000m, 1200m to 2015-16 in Aust. Shushtar. 5 wins-1 at 2-from 1200m to 2000m, A$91,880, AJC Gainsborough H., STC Silastic Auto H., Tooheys Blue H., 3d MVRC P&O Mile H., STC Newbury H., Grace Bros Jeans Plus H., 4th STC Peter Pan S., Gr.2, Costain Australia Gloaming S., Gr.2.